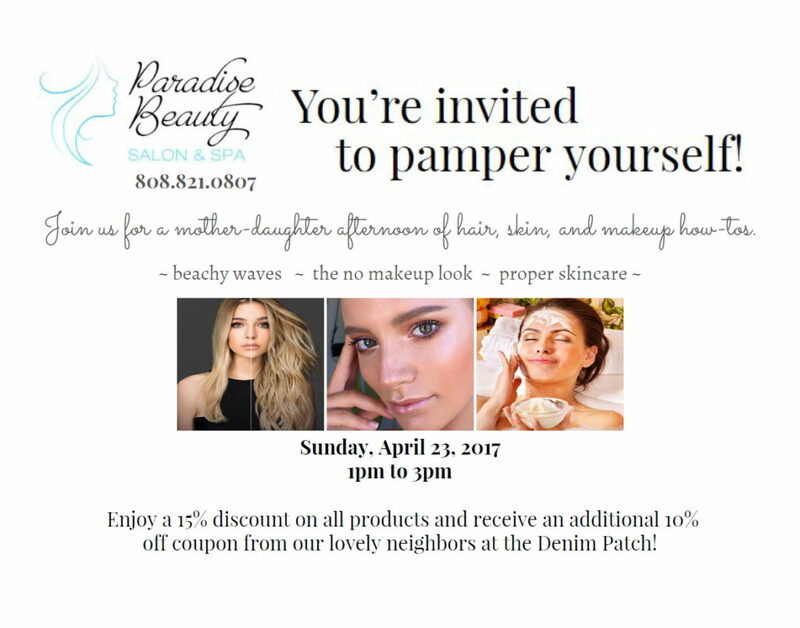 Join us for a mother-daughter afternoon of hair, skin and makeup how to’s….Sunday April 23, 2017 from 1:00pm to 3:00pm at Paradise Beauty Salon & Spa in Kapaa Town. Enjoy a 15% discount on all products and receive an additional 10% off coupon from the Denim Patch. Please RSVP by calling (808) 821-0807 or by email to liz@paradisebeautykauai.com by April 19th with names and ages. This will allow us to have a special gift for each person that will be attending. We will be serving pupus, Kauai Juice Co. Kombucha and wine for the Mothers! This is an event to educate and bring awareness to all the treatments and products that we offer to help you with your beauty goals.